and will provide a vehicle for them to shine in this arena. and organize around their children to do football, basketball, baseball, and soccer. The primary objective of the concept of The Flagway™ League in cities and communities around the country, is to create opportunities for teams, coached by high school and college students, to compete locally, regionally and nationally. 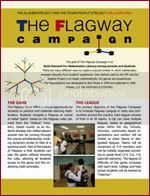 Schools, churches, community based organizations and centers are invited to enter teams into the national tournament once they have completed a flagway training, lead by YPP and a course of local practice sessions.